Royal Caribbean produces a lot of commercials, and one of its newer commercials features a gay couple getting married on a Royal Caribbean ship. Royal Caribbean wants everyone to consider getting married on a Royal Caribbean ship, and uses couple "Gabriel and Blair" to show how fun and special a wedding at sea can be. Royal Caribbean describes this advertisement simply as, "You’ve never settled for the ordinary. Your greatest adventure yet should be no different. Venture far from the beaten path with a Royal Caribbean wedding ceremony. Royal Weddings amenities include complimentary planning to ensure every moment becomes a cherished memory for you and your special someone. Discover the breathtaking possibilities onboard and across the world." Tip of the hat to Instinct Magazine for alerting us to this commercial. 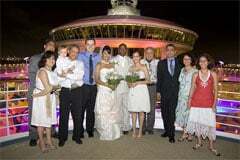 Royal Caribbean is now offering weddings and vow renewals in a new program called "Sweethearts at Sea". 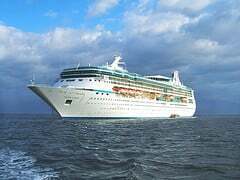 The Bahamas has cleared Royal Caribbean to conduct legal weddings aboard their cruise ships while at sea. Couples wishing to share this special moment with friends and family can enjoy the Sweethearts at Sea promotional offer, inclusive of a ceremony performed by the Captain, photography and more, when booking 12 or more staterooms on a 2013 Royal Caribbean International sailing during the special introductory offer. Couples will work with the Royal Romance team of wedding specialists that will work with you to create an event that reflects the desires of the bride and groom.The Royal Romance team assists in wedding planning services, including any legal requirements pre-departure, and once onboard, the Royal Romance Coordinator ensures every last detail is taken care of for the special moment. The Sweethearts at Seas is now available to be booked for cruises starting January 1, 2013. For more information about the Royal Romance Programvisit us at www.RoyalCaribbean.com/weddings or call 888-WED-RCCL (888-933-7225).